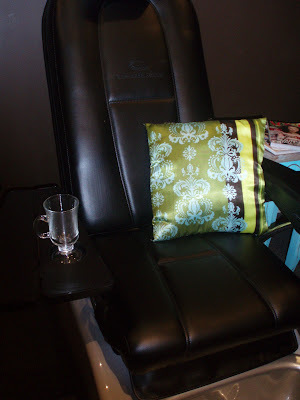 Here are the made in china pedicure chairs, soon to be gone, gone gone, lesson learned - gone! See all gone! 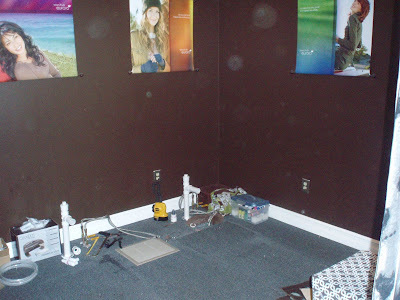 Empty spaces waiting for the made in Wisconsin:) pedicure units! Want a peek? Here's one!! Did I just see it wink? Such a flirt these chairs are! Bright, shiney, inviting and almost smelling of new car smell:) Ready to test it out...who will be the first to review Mr. or Mrs. Rinato!?! Really, for those of you who have appointments with me tomorrow, don't worry if you're running late...you'll find me, relaxing in these chairs, with the heat and massage running up and down my back! Loook, they even have cup holders!! Per Thomas request! Something that he thought the old ones were missing! Generally when I make this statement, I mean my boys, when they have arrived safely someplace, I say this:) It makes me feel all covert! (remember, I'm embracing my corniness) BUT today, it's my new additions to the Bijou Staff...Mr. and Mrs. Rinato!!! 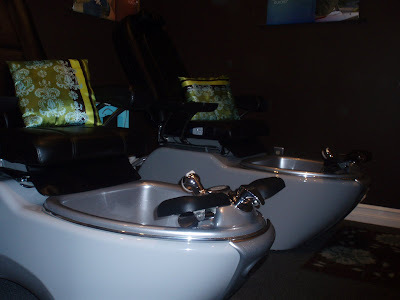 (A standing ovation IS necessary, I'll clap for you:) I can promise you these two will not disappoint and they are surely the best pedicure chairs in Skaneateles!!!! 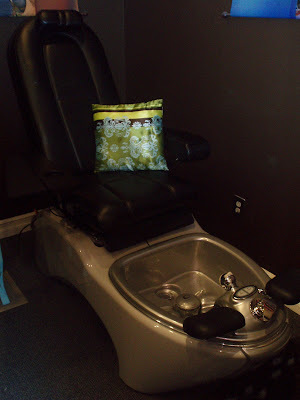 Well let me tell you, as I type this....I hear drills and other things that go buzzzzing....One old, crappy made in China pedicure unit has left the building, and they are working on the next one, disassembling it as we speak.....scratch that..as I type! Hmmm strange, I hear filing...could the one guy be giving the other guy one last pedicure? Maybe I should go back and check! Okay no worries, they are just filing the pipe, when they cut it, it cuts at an angle, I know, you don't reallly need to know this, but bare with me, I'm excited!!!! Can someone call the kids, I may have to sleep here tonight on the nice comfy pedicure chairs! update: The last one is being installed, I hear things like..."I don't hear any leaks, but I need your confirmation." and "I don't see leaks, I don't hear leaks, no leaks no leaks!" Okay, it's late and these poor guys have worked hard. They are in and here are the pictures! They are beauties aren't they!?!?! Just for you, and you and you and you!! update #2: OOh I just learned a really cool fact about these chairs...(we are all about being CLEAN here at Bijou!) The unit has a little fan on the bottom, as it is not a piped whirlpool, so the fans are way better, and our little fan has 3 little parts, that unscrew easily and then we clean them and put them in the ultraviolet sanitizer and the cool part is, each unit has an extra set, so we can use them, disinfect them with sanitizing solution and then put them in the ultraviolet sanitizer for a while! Ahhh, I love simple solutions for cleaning!! !